Today, let’s join with my fellow author Stan Hampton in remembering those who have served and those who have fallen in the service of the United States. We pray that everyone has a safe Memorial Day weekend. 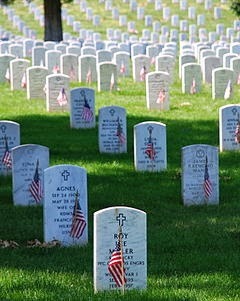 Today is Memorial Day. It is a 3-day weekend for much of the country—a weekend of family get-togethers, BBQs, and great sales. That is fine. It was after World War I that Memorial Day came to recognize all of those who fought and died in America’s wars. From the American Revolution (1775-1783) to Desert Shield/Desert Storm (1990-1991), the total American combat deaths number 651,031; the greatest number of war dead was 291,557 suffered by the Greatest Generation during World War II (1941-1945) . As for the Global War On Terrorism (2001-), or the Long War as some may call it, according to the Defense Casualty Analysis System, 5,363 men and women have died in combat. Unfortunately, the world is not a safe and secure place. Yet, we know that in our nation there will never be a shortage of uniformed volunteers willing to stand between unarmed men, women, and innocent children, and the senseless evil in the world. On Memorial Day this year remember the “National Moment of Remembrance”—at 3:00 PM local time across the country, everyone is encouraged to take a moment to reflect on those who have given their lives for our country. Whatever war they fought in, all of those who made the ultimate sacrifice have names, whether those names loom large in history books or are known only to their families. And some of us know the names of comrades who made that sacrifice during the GWOT. Let’s hope that citizens everywhere will stop and thank the soldiers who have served throughout the years to keep our freedoms safe. When we lived in France, we visited the American Cemetery in Normandy numerous times. The first time I saw it, I literally fell to my knees and cried. Another touching thing was to see the many small cemeteries in the middle of farmers’ field in France lovingly tended by the local French citizens. They truly are very thankful for the help America gave them. Take some time to reflect on those brave men and women lost in battle. Without them, who knows where our country would be? Thank you. Thank you. Someday I would like to visit Normandy. I’m sure it is a heartfelt and very somber memory for many people.